Even though the hymnal says the text is by “Anonymous,” there’s evidence to suggest that it was in fact written by the reformer, Martin Luther. See Jason’s comments below. The text is another beautiful lullaby to the Baby Jesus. The tune has a lilt in it with eighth notes at the end of many of the bars, on beat 3. Quarter, quarter, eight, eighth. Almost every time the lilting eighth notes occur in the melody, one of the other voices follows along. The alto, tenor and bass each take a turn or two singing their own 2 lilting eighths all by themselves. The second line continues the minor 2 chord for a while before moving towards the 5 chord and pausing on it for a half cadence at the end of the line. Line 3 starts the tune over again and sings the same melody as line 1. The harmony is mostly the same until the very end where we get a 5 or 2 chord (with the F# in the bass) pausing on 2 chord. And line 4, with nearly the same tune as line 2, follows suit in the harmony matching line 2 until the very last moment. The tune is gentle and rises for a full line, then spends the next line working its way back down. It does that both times and ends carefully at the end, as if gently placing the baby Jesus back in the manger. Not much to it. It’s lovely and simple and a Christmas staple. The text for this popular carol is commonly attributed to Martin Luther. It has often been called “Luther’s Cradle Hymn.” The text first appeared anonymously in Little Children’s Book: For Schools and Families (Philadelphia, 1885). Two years later, it was published in Dainty Songs for Little Lads and Lasses (Cincinnati, 1997 by James R. Murray, who printed the song under the heading “Luther’s Cradle Hymn,” commenting that it was “composed by Martin Luther for his children, and still sung by German mothers to their little ones.” Though it is nice to think about, it is likely that attribution to Martin Luther is in error, and that the text comes by anonymous means. This text suitable for children singing has been set to several commonly-known tunes, but the tune most commonly used in hymnals is CRADLE SONG by William Kirkpatrick, a suitable melody for its simplicity and dignity. It is a very fine tune, and I think it is the best of the tunes used for this text. For congregational singing, I think it very important to not take this at a tempo that drags and is laboriously slow. There must be forward direction for the singer to maintain support. It is not good to have a hymn played so slowly that folks must breath during a phrase. The tempo I think is very appropriate is around 86-88 beats per minute. This helps maintain that forward propulsion that should accompany congregational singing. I recommend a soft registration for this hymn, and likely would not add any stops at any point, but keep the registration soft and simple. We always talk about Jesus’ birth as a quiet, Silent Night. A reverent scene with sweet little animals quietly gazing in wonder and the special baby and mother. I don’t know about you, but I’ve never seen a ‘reverent scene’ of any kind when barnyard animals are involved. But I’m not exactly keen on barnyard animals, so maybe that’s my problem. It seems more likely that Mary and Joseph were camped out in what must have been a filthy, noisy, smelly hole in the side of a hill with animal droppings all over. Of course it was still beautiful, I’m sure. Child birth is the most beautiful thing I’ve ever seen. Suddenly there’s another person in the room where there wasn’t before. It’s incredibly fascinating. And that this baby was the Only Begotten… well, you know how special that is. I like this hymn because it seems to combine a sweet little children’s song with the rustling and noise of a cave full of animals. There’s the tune, and then there’s all the hustle and bustle of moving parts and stomping hoofs around it. The tune of the first 4 bars is repeated exactly in the second 4 bars. But the harmony is different, which I always appreciate. The second 4 bars begins with the bass up on the top of the staff and stepping down as the tune restarts. It’s a nice contrast with the start of the first 4 bars. There’s a bit of chromatic harmony in the alto with the B-natural, and the phrase ends as it did the first time. Now we leap way up to a high D to begin both of the last 4 bar phrases. The bass line gets the sheep going and we have a bit of a shin-dig in the cave. The bass line runs right up the scale, almost to the top in a string of straight eighth notes. It happens a second time and the altos join in the fun, followed by the soprano and tenor reversing the stepping eighth-note motion down to the final cadence. And why not? Yes, it was a special, unique, earth tilting moment. But it was also a backwater, in the fields, rustic kind of moment. It’s a lovely Christmas song and very worthy of our hymnal. Since 1919, this carol has been the processional hymn at Lessons & Carols services at King’s College, Cambridge, and many similarly-patterned services in churches across the world. Traditionally, a boy soprano sings the first verse as a solo. We can actually see the influence of the King’s College, Cambridge tradition of Lessons and Carols on this hymn. Before several recordings of Lessons and Carols were released in the mid-twentieth century, this hymn was little-known and little-performed. After the recordings, the hymn gained immediate and wide acceptance and popularity. The text was first published in Hymns for Little Children (London, 1848). This publication contained thirteen hymns written by Cecil Alexander to explain phrases of the Apostles Creed. (Additional texts we are familiar with from this collection include “There is a Green Hill Far Away” and “He is Risen!) “Once in Royal David’s City” is a commentary of the third article of the creed which says “who was conceived by the Holy Ghost, born of the Virgin Mary.” Our hymnal contains three of the six commonly used verses. This outstanding text is always set to Dr. Hanry Gauntlett’s tune and was included with this text in a pamphlet Christmas Carols or Lays and Legends of the Nativity (London, 1850). The standard setting used at King’s College and many hymnals (but not ours) is by Dr. Arthur Henry Mann, a one-time organist at King’s College. If “O Come, All Ye Faithful” is Christmas to me and many because of the David Willcock’s harmonization, this hymn is close on its tail for making Christmas. Again, David Willcocks’ setting of the Mann arrangement is most often used as the setting for the opening of Lessons & Carols. It is a tremendous harmonization and descant of the sixth verse and should also be universally used when this hymn is sung. Of a personal note, I am especially excited that my oldest son will be singing the opening soprano solo from the church balcony for our Lessons & Carols this Sunday! A good tempo for this stately hymn is about 86 beats per minute. That moves the hymn along nicely without rushing or dragging. I would begin with a solid registration and build through the verses till I have a very full registration for the final verse. One of my favorite scenes in Disney’s original “101 Dalmatians” is when the 99 puppies hid out at a dairy farm. The cows are very motherly and accepting, happy to help a bunch of poor little starving puppies. For some reason I think of these care-taking cows when I hear “Silent Night.” I imagine a herd of Anderson Sisters in the Bethlehem stable soothing the baby Jesus. Of course this is a special hymn/carol because we’re singing the baby Jesus to sleep. There’s an automatic aura of holiness and wonder built in. Franz Gruber was wise to keep the music very simple. There are only 3 chords, the 1, the 4 and the 5. They rock gently back and forth in a triple meter, like most lullabies. To keep the baby from waking, the register is mostly low. There are a few more expressive higher notes and a rather high E-flat at the climax. But it’s sung in a light head voice rather than a rousing roar. And it gives us the chance to express our emotion at the beautiful scene. It is perhaps the most beloved Christmas hymn/carol of all time and will undoubtedly remain in the new version of the hymnal. Much can and has been written about this beloved carol and its origins as an impromptu carol written by an Austrian parish priest and organist on Christmas Eve when the organ broke down. On December 24, 1818, Joseph Mohr wrote a six stanza poem that he brought to his organist, Franz Gruber, and together they worked a tune to sing the poem and sang it at the evening service, with the choir joining in on the last two lines. The carol was instantly famous and spread far and wide by traveling musicians throughout Europe and the United States. The most commonly used English translation is by John Freeman Young, and the most commonly verses used are the first, sixth, and second verses of the original. It is no wonder this sacred hymn is beloved by almost all of Christendom. It wonderfully captures the reverence of thinking of that sacred night when the Savior of Heavenly Father’s children was born. For me, nothing captures the beauty of the text and tune better than two arrangements by Douglas E. Bush that I use religiously every Christmas. The first is a simple arrangement for organ that works so beautifully as an introduction to the hymn. The second is his setting for choir that includes hauntingly beautiful descants for the second and third verses and a tremendous reharmonization for the organ to play on the third verse. This link is the only place I could find a recording of this sacred hymn and is representative of the great work that Doug Bush did in his stake and for so many. https://youtu.be/jedaPm3vA9c?t=4222 I have a great deal of love and appreciation for Doug Bush, as he is one of the primary figures responsible for the path in music and the organ I have taken. The the hymn is contemplative and serene in nature, it can be taken much too slowly. I find that I take it somewhere in the vicinity of 92-98 beats per minute. This is still slow enough to keep the quiet reverence of the piece, but not so slow that it suffers from dragging. I would use a very soft registration, only employing enough of the organ to support the congregation in singing. Hymn #203 is a study in creating a hymn out of only 2 lines of music. Lines 1 and 2 are identical in every way except for the text. Lines 3 and 4 are each 6 bars long instead of 4 bars. But they are also a copy of each other. The only difference is the final cadence which elongates the end of the 3rd line. So, as far as creativity goes, this French carol is a bit repetitive, but it still works the action in the Gloria section is so much fun. Lines 1 and 2 are pretty straight forward musically. 1 chord, then 3 chord, then a 6 chord, a 5 chord and another 1 chord to get started. Then a 1 chord, 5 chord, some more 1 chord for a bit, then a 5 chord followed by a final 1 chord. The tune pretty much keeps to the 1 chord jumping between A, C and F with a few touch downs in between. The Glorias are much more interesting. I think it’s safe to say that this is the longest melisma in the entire hymnal. Remember what a melisma is? It’s a line of music that has only 1 syllable of text. This melisma is 16 notes long. And it’s fun to sing. There’s a little boy in our ward that belts this sucker out every time we sing this hymn. It’s amazing how much sound can come out of a 6-year-old when he’s excited. Then we do it all again, hold out the “Deo” a little longer, and we have a fun Christmas hymn. There’s not much more to it than this. Pretty simple stuff. But enjoyable to sing. The fourth verse not in our hymnal is this: See within a manger laid Jesus, Lord of heaven and earth! Mary, Joseph, lend your aid, sing with us our Savior's birth. Would be a nice addition. The tune was first published with this text and the two are synonymous with each other. It is a very good tune and evocatively brings feelings of Christmas time. A brisk tempo is very appropriate for this lively and spritely tune. Somewhere in the vicinity of 126-130 is a good peppy tempo for this hymn. I would match the bright tempo with a bright registration, utilizing high mixtures, but not filling out the sound too much. 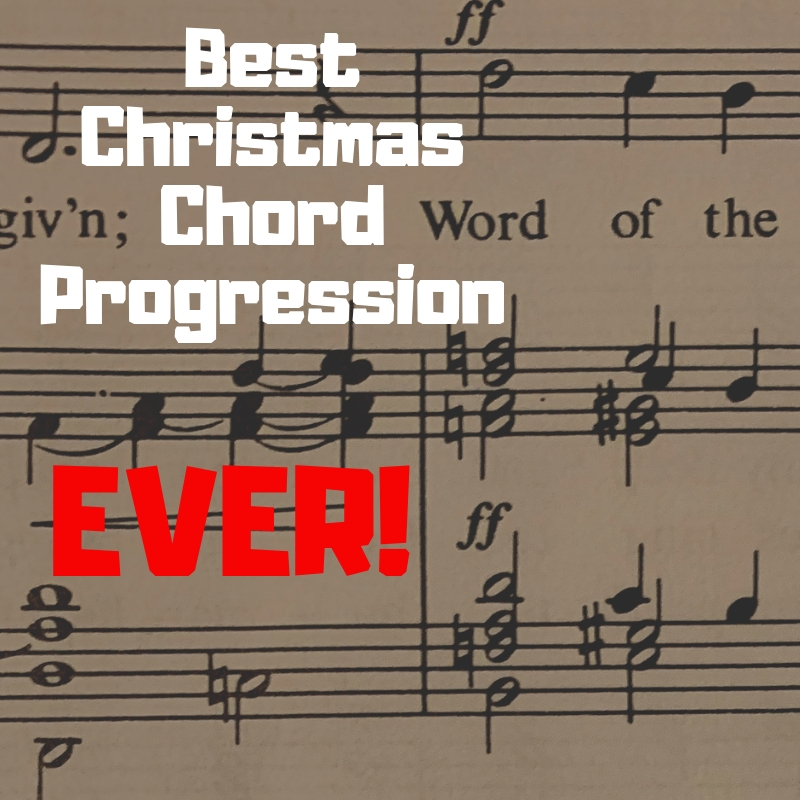 Best Christmas Chord Progression EVER! Do you want to hear actual “choirs of angels” singing? Someday we’re all going to be sitting in the after life attending a Lessons & Carols Christmas service. This is the primo example of what great congregational hymn singing is and can be. Oh how I wish we would have more of the THIS kind of hymn singing in our Church. Now, you MUST listen to this. This is King’s College Choir at Cambridge University. These guys do religious Church music better than anyone in the world. Sir David Willcocks was their choir master and organist a long time ago and he wrote a ton of stunning arrangements of favorite Christmas carols for choir and congregation. Here is the Willcocks “O Come All Ye Faithful.” Now, pay close attention. At the 2:15 mark there’s an amazing descant sung by the boy choristers (these are real choristers, a chorister is NOT someone who directs music in an LDS church service… just a little FYI). After the verse with the descant, the final verse occurs. It begins at the 3:15 mark. At the 3:40 mark, the heavens actually open and harmonious sounds of THE MOST incredible harmony, harmony that encases the entirety of the Atoning power, redemptive emotion, and universe creating powers from beyond all come together and rock the very foundation of Christmas. Pay close attention. It only lasts for 12 seconds. Listen a few times. Then go back and listen to the whole thing again. I can’t think of any single chord that packs the emotional punch, the real meaning of Christmas, the full weight of the power of God on earth through His Son who descended below all in the entire repertoire of classical music as this chord and the progression that follow. And really, I’m not overstating this. Ask any organist. Ok, here’s the clip. Now, LISTEN, please… I beg you! You MUST hear this! Here’s the actual music of this passage. That’s all I have to say today. Please use this version. Please. And please, let’s sing like this more often in Church. Please, please, please!!! This is perhaps my favorite of all the hymns sung at Christmas time, and I owe that all to Sir David Willcocks. The text for this hymn is considered to be the work of John F. Wade, a copyist who’s copy work is the only source for the original Latin text. This text appears in seven manuscripts from the eighteenth century and not before. All of the manuscripts were copied by Wade, therefore it is presumed he is the author. His text has been translated many times, but the most known and used is by Frederick Oakeley, with some alteration. He penned the first line as “Ye faithful, approach ye” rather than its current first line and title. Not all of the verses of the translated text appear in our hymnal, as the hymn in some translations has at least nine verses. The tune is also attributed to John Wade, as it appears in the same manuscripts copied by Wade as the text. There is some debate as to whether is is unique to Wade, as other composers have tunes attributed to them with similar characteristics. Known today by the name ADESTE FIDELES (the first line of the Latin text), it was formerly known as PORTUGUESE HYMN, as some hive proposed that the tune is of Portuguese origin (including perhaps by a former King of Portugal), and it was first heard in England in the chapel of the Portuguese Embassy in London. David Willcock’s magnificent arrangement of this hymn is the primary reason for my affinity. He wrote a masterful harmonization and descant on the penultimate verse, and then another harmonization for the final verse. Church organists worldwide know “the chord” that is so remarkable in the last verse on the word “Word” (in our hymnal, the word is “Son” at “Son of the Father”) and the triumphant build-up to that chord. We sing this every year in Lessons & Carols and anytime I play in Sacrament Meeting, I use this harmonization. Many opine that it is not Christmas until “the chord” is reached! I encourage all to find and use this arrangement! A strong, stately tempo is recommended here. The church I play in isn’t overly resonant, as is the case for all of our chapels, so at about 108 beats per minute is where I find the tempo lands. This is a good stately tempo, but not too slow as to drag. If you found yourself in the marvelous circumstance to be in a very resonant room accompanying hundreds and hundreds of voices, you might take it a few clicks slower, but such will not be the case for almost all of us. Using a strong registration that builds to the final verse is good practice. I can’t think of a better hymn to kick-off the Christmas section in our hymnal. Right away we’re tossed into the “joy” of the season with a rousing high register and dotted rhythms. The entire hymn is built on a descending scale, a few dotted-eighth sixteenths, and a winding up repetitive fire cracker. Why not begin the melody with the high D and blast out the word, “Joy!” I love it. And then after the scale descends, we get to climb back up bar by bar… “earth receive her King!” until we return to the high D.
I really like a brisk tempo. It helps the long note on “King!” feel not so long. And luckily, most of the words are short, single syllable words which makes it easy to sing the words at a fast tempo without getting garbled. The second phrase is a series of 2 more descending scales from the high D, but this time the scale is sped up and dancing over a pedal bass note. I like to play around with the pedal note in the final verse. I’ll descend down bar by bar, D, C-natural, B, A, for a little variety. Phrase 3 is where the little wind up fire crackers occur, 4 repeated notes with the 4th one shooting up through sixteenth notes. The off-set men’s parts are add some extra fun to the festive spirit. The fourth phrase begins with the last of the fire crackers which descend to a low D and a quick octave leap up to high D before descending in a similar way as phrase 1, though taking varied approach to the final D.
There aren’t too many bells and whistles. Just good old fashioned writing, not holding back the joy of the season. The harmony is completely diatonic (fitting the key signature). They rhythm does a lot to propel the hymn forward. It’s all around an excellent Christmas hymn. I hope that when you program this in your ward, you’ll take it at a festive quick tempo and let that organ sing out with a boom! This is a tremendous hymn to begin the Christmas section of our book. This text is a paraphrase of the last five verses of Psalm 98 by the master hymn-text writer, Isaac Watts. It was not originally intended for Christmas, but was published it in Watts’ Psalms of David Imitated (1719) under the heading “The Messiah’s Coming and Kingdom.” Such is the nature of this hymn as apt for the Second Coming that the text in our hymnal has been edited by William Phelps (a common occurrence with this text, as it has a long history of being edited by others…) to more reflect the millennial message. The tune is attributed to George Frederic Handel and as being edited by Lowell Mason. It is unclear how much of the music is Handel’s, though it is clear that much of the melodic material is derived from his Messiah. It is likely that Lowell Mason took themes from the Messiah and combined them with the Watts text. When I play this hymn every Christmas Eve (it is the final hymn for all of our services), I like to use Mack Wilberg’s arrangement as the source of my introduction, interlude, and harmonization. I think it works very well. My postlude this year after Bach BWV 729 is an arrangement on this hymn by Craig Phillips, followed by I Saw Three Ships by Richard Elliott. I highly recommend the Phillips arrangement! Both registration and tempo should be bold to exclaim the arrival (or coming) of the Savior! A tempo around 106-108 beats per minute is a great tempo to drive this majestic hymn forward with gusto (please don’t ever play it as slow as suggested in the hymnal, at least not at the slow end… I suppose that the very top of the range is okay, but 76 is mighty slow!). Utilizing the full resources of the organ for your registration is a must! Hymn #141 has never been a favorite of mine. I’m not exactly sure why. I’ve been trying to put my finger on it. The text is beautiful, for sure! Gorgeous, in fact. Something about the music doesn’t excite me. I like the 2nd half much better than the first. The slip to A-minor at the start of the 2nd line is beautiful and haunting. The final 3 bars are also very lovely with the bass line and soprano moving up in parallel 3rds before the final cadence. I think it’s the opening of the melody that I don’t care for. Starting near the top of the overall register with three of the 2nd highest notes in the piece in a row, I think that’s what’s bothering me. John Dykes does a nice job of keeping the tune motivic, meaning he uses the opening kernel, the repeated notes, to start the 2nd phrase (on the low D) and again in part at the beginning of the 3rd line with two Cs and then stepping down. So I have no problem with the craft. I think it’s very well done. But those first 4 bars. I’m not sure what it is. Maybe one of you has an idea about why I’m not super excited about that opening phrase. All the other musical elements of the hymn work really well. It’s worth studying and seeing how the voice leading works well with lots of contrary motion most of the time. That’s all I have to say about this hymn. I think Jason is much happier with this hymn than I am. I’m not familiar with the arrangements he mentions, but I plan to listen. P.S. Tomorrow we’re going to take a detour. We’re going to have the 14 Days of Christmas Hymns. We’re going to leap ahead to Hymn #201 and go through all the Christmas hymns ending with #215, “I Head the Bells on Christmas Day” on Christmas Day! Should be fun! This hymn, for me, easily earns a place on the list of the very best hymns. The text is one of a number of different translations of the Latin poem Jesu dulcis memoria commonly attributed to St. Bernard of Clairvaux. Another commonly used translation is “Jesus, the Very Thought is Sweet” by John Neale. The text used here is from a 50 stanza translation by Edward Caswall. Part of the draw for me to this text is that it is close to 900 years old. It is tremendously inspiring to be using a text that has been drawn upon as a source of inspiration and prayer for almost a millennium! The text is most often set to the tune ST. AGNES by John Dykes. It is a simple tune, and another fine example that hymns needn’t be complicated to have lasting impact. The simplicity of the melody and the beauty of the harmony pair very well with the meditative nature of the text. I love this hymn, I love the text, and I love the tune, and find it to be one of the very greatest hymns in hymnody. One should exercise caution to not equate reverence and meditation with slowness. Even though this sublime hymn is very meditative and quiet, it can be taken too slowly. I find that a range between 88-96 beats per minute provides a good range within which to work depending on circumstance. I would use a soft registration, and would likely not alter my registration during the course of the hymn. Whenever I hear or sing or play this hymn, I think of my grandma Pew. She was a short, cheerful, loving, firecracker of a grandmother. Though she barely reached 5 feet tall, she was a towering powerhouse of a woman with the most intense love for and testimony of the Savior. 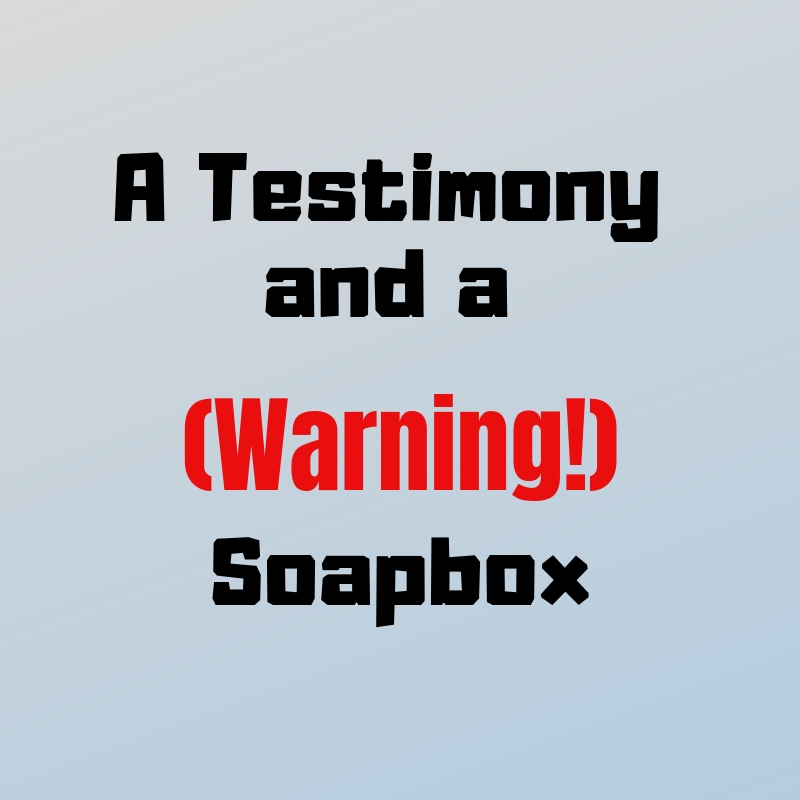 She NEVER missed an opportunity to testify to her grandchildren of the Savior. She was also a party animal. Any excuse to celebrate meant we HAD to have a family gathering. Baptisms, national holidays, anniversaries, birthdays, Groundhog’s Day (not really, but it felt like it sometimes)… she LOVED to be with her big family. And since most of us lived in San Jose and within 15-20 minutes of each other, we got together all the time. It was great! She’d have boy cousin sleepovers and girl cousin sleepovers. She’d invite each family over in turn for dinner. Offer to take the grandkids if our parents were going out of town. Any excuse to be together, she would jump on it. And not matter how formal or informal the occasion, she made sure she taught us the gospel. We loved it. We were sometimes annoyed by it. But we really loved it. Even on her deathbed, with hardly a breath left in her body, she testified boldly of the Savior in a way and with a power a will never forget. I’m so grateful for her example and CONSTANT teaching. Though Hymn #140 is not a particularly amazing specimen of hymn composition, it has a special place in my heart. It is more of a song than a traditional hymn. The first half feels more like a Primary Song to me. The chorus opens up a bit more and becomes more hymn-like, allowing for a fuller range of expression. The melody in the first half stays mostly in the lower half of the vocal register. And as it is rather repetitive, like a children’s song, this lower register seems appropriate. I think it is why so many people like it. It’s lower, in a comfortable register, and sing-song. The low B-flat is about as low as I feel comfortable going in a congregational hymn. Many times when I’ve been struggling or afraid or not sure what to do, I hear my sweet little powerhouse grandma humming this tune in her deceptively low contra-alto voice. It reminds me to go to the Lord and remember that He is my advocate and can help through whatever storm is raging. Will it stay in the hymnal? Almost certainly. It’s too much of a favorite. And, from what I can tell, it seems to translate well to other languages, at least the ones I’m familiar with. This hymn is found in many hymnals. It found particular prominence after the middle of the 20th century. It is one of the more popular tunes in our hymnal, and I find that it is sung relatively often in meetings. Despite its popularity, I don’t find it to be the greatest of hymns. It is more song-like in nature and I don’t think the text or tune are the greatest. I don’t find the line “did you think to pray” to be so artful as to deserve the number of times the line is repeated. While I haven’t been bothered by the large range of some of the other hymns, I find the melodic range of this tune to be too big. B-flat is a very low note for congregational singing. The nature of the tune is also very slow. The rhythmic movement seems to happen often with eighth notes, so the tendency is to go more slowly to accommodate that movement, but some of the cadential moments are an entire measure long. To me, this is very awkward. I can, however, understand the appeal this hymn has that has propelled it to popularity. I also think that Mack Wilberg’s arrangement for choir of this hymn is very nice. In addition to being slow in nature, this hymn also suffers from being played chronically slow. To make this hymn less dreary from a tempo standpoint, it is most advisable to play this hymn in two. That gives you a chance to overcome the slow inertia. I can’t imagine any in a congregation being comfortable with this hymn sung at 72 beats per minute. This tempo highlights the awkward nature of the tune. It is a fine tempo for the movement of the eighth notes, but interminably long for the cadential moments. I find 98 beats per minute to not be too fast for the eighth notes and not as long for the full measure cadential moments. I would use a similar soft registration as recommended in earlier hymns. Our pickings are pretty slim when it comes to hymns about Fasting. Luckily, the 2 hymns on this topic are expertly composed by 2 great LDS organists. The first, Hymn #138, was composed by James Welch. It starts out simply enough, but with a fairly standard opening tune and starting harmony. There’s a nice expressive leap up to high D in the first line, but it’s otherwise not super intriguing. The soprano and tenor suspend over from the the pick up on “Feed.” The bass and alto leap down forming a G chord, the 4 chord in this key. Because it’s a 4 chord, it’s sounding pastoral and expressive. But add to it the F# and the A, suspended from the previous chord, and you get some exquisite French harmony. A G major chord with a major 7th and a 9th. Delicious!!! The end of the third line takes a turn towards the key of E minor. First we tonicize the B minor chord on “and bless” with an F# dominant 7th chord. Then before landing on the E minor cadence, we get a D# in the bass and a fully diminished harmony above it. This pulls us towards E minor without any hope of going elsewhere. After beginning the 4th line with another E minor chord, we pass through some more F# dominant chords, the ones with the A#s, through another fully diminished 7th on G#, and finally back to D major to end it. Wow, good stuff. And that G major 7th chord with a 9th at the beginning of line 3, yes please, more and more and more of that! This is a really lovely hymn a deserves its spot in our hymnal without any question. The 2nd hymn for fast Sunday was composed by recently retired Tabernacle Organist, Clay Christiansen. Like the James Welch hymn, there are some more lovely and colorful harmonies. But he manages to achieve these sounds without any accidentals. Pretty cool. The hymn begins with a long pedal point on C in the bass. This lasts for the entire first half of the hymn. The harmony moves around through many of the diatonic chords (the ones that belong to the key signature) all over that pedal C in the bass. By the time the C steps up to the D in the bass, it’s very rewarding. He’s been keeping us in suspense as to when he’d make a move off of the C. He then used some lovely suspensions and other non-chord tones that bridge the gaps between chords. The tune begins in a very mellow, very humble sounding mode with the low Cs and other low voice notes. By the middle of the hymn, when the bass finally moves, we’ve made it up to a high C in the melody. It then steps down and back up again to the climax on high D.
I really like how it descends after the high D. The C-B-A, the the A holds over in a suspension with a dissonance in the tenor, the B, which is rising up from A to C. The the “F-E-D-C” at the end after the big leap down to low F and finally rising up to C. Lovely diatonic harmony. Very well written. Again, we have a winner that deserves its place in our hymnal. Very well done, gentleman! The text for this hymn comes in response to counsel from President Spencer W. Kimball remarking that devotional poetry was an appropriate Sunday activity. This hymn was the first collaboration and attempt at hymn writing by both John Tanner, a professional in the field of literature, and James Welch, a professional organist. The result was a very good hymn both looking at the text and tune. I especially like the richness of the chromaticism of this hymn. Unlike hymn #132, it makes sense and is very interesting while still very singable. I think it a very good hymn for Fast Sunday. To execute this hymn well for congregational singing, I think that it is again helpful to feel a macro pulse in two even though it is notated in four. The top of the suggested tempo range is a good tempo, so I would play it at 96 beats per minute. A registration rich in fundamental is a good registration here. 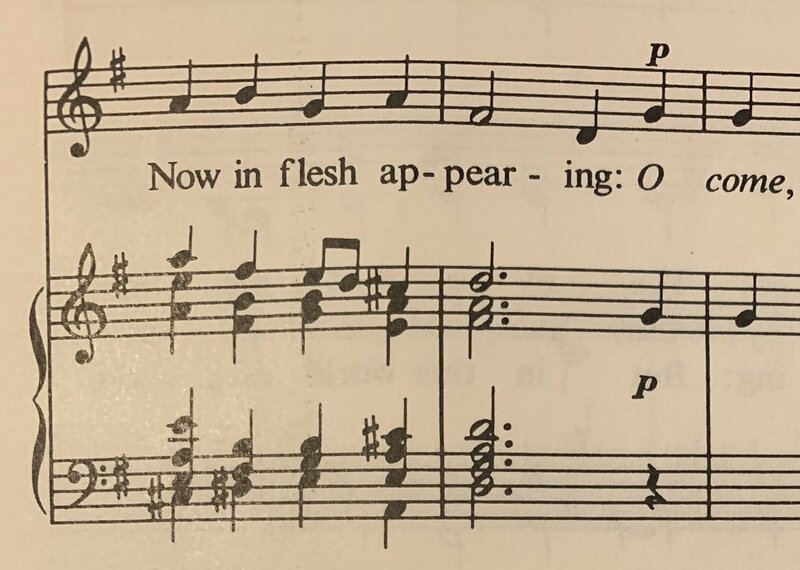 The second of our hymns explicitly addressing fasting, it is also the second for which the tune is provided by an organist and for which I am quite drawn to the hymn for its tune. This text is a wonderful example of a prayer focused on the purpose and reason for our fast and is a wonderful hymn for Fast Sunday. The tune I think is extremely compelling and a wonderful hymn tune. The shape of the melody is wonderful for a fervent prayer, with a continual rising through the hymn until around the golden mean, and then a return to the beginning note. Brother Christiansen does a remarkable job of letting a rather simple scaler passage have much melodic intrigue. He enhances the melody by a wonderful harmonization that highlights the home key. When I play this hymn, I like to emphasize the pedal tone by repeating it off the rhythmic movement. So I hold the pedal tone, only repeating it on beat two. I feel this gives the tune tremendous direction and enhances the forward propulsion. This is a great hymn. This is also a hymn that is successful at a slower tempo. An excellent way to conceive of this wonderful hymn in a slow, stately manner without dragging is to think of it in one. This keeps the melody moving forward, but provides a stately slow march to undergird the half note-quarter note rhythmic repetition. I prefer the middle of the suggested tempo here, finding the high end too rushed. I find I play it around 94 beats per minute. A strongly fundamental registration is again suggested. What makes a hymn carry a powerful spirit? How can the Holy Ghost ride on little notes on a staff and sail down into our hearts? I’m constantly amazed by this phenomenon. Just typing it over and over again brings swells of spiritual feelings roaring up inside me. Declaring our allegiance, our belief, our faith, our knowledge, our love of the Savior is incredibly powerful. The role of the music in this case, I feel, is to help us express these feelings. And, if we don’t yet have a fully developed testimony (and let’s face it, who does? ), at whatever stage of life we’re at, we need to grow. The expression of that testimony, even if we’re wavering, makes it grow. And the melody acts as a “remembering” agent. It’s like Neville Longbottom’s remembrall, only we won’t forget what we’ve forgotten. We’ll remember what faith feels like, even if we haven’t felt it since before we came to earth. The music is simple and soothing. The tune is steady, encouraging and allows us to express the full range of emotion because it gives us lows and highs. The opening of the chorus, F#-A-D, “He - - lives” is a powerful use of a simple arpeggio, leaping right up the notes of the 1 chord. We get it a 2nd time in a very folk-song-like manner, reiterating our belief. The 3rd time the tune steps down, B-A-G, and lands on the 4 chord, that warm, shepherding, pastoral feel. And the final line ascends again, G-A-B, but this time with a little extra juice provided by the C# in the tenors. When I was a teenager, my cousins and I formed a choir, the Pew Family Youth Choir (PFYC for short). We sang an arrangement of this hymn very often. It was an important time of life to express testimony. I’m thankful we did that so often. A few years ago, Elder C. Scott Grow came to our stake in Cincinnati. I was asked to pick the hymns. Elder Grow asked for only 1 change. He wanted the closing hymn of the general session to be this hymn. I complained a bit when I heard the news. But on the day, I was so glad. He was spot on. He spent about an hour closing the session mostly baring testimony of the Savior. It was the perfect way to end the meeting. This is a MUST-keep-or-there-will-be-riots kind of hymn. Michael Moody’s “Testimony” hymn is another lovely selection. I like the tune a lot. It’s simple, but has some surprising turns that keep the interest and allow expression. The first interesting bit is the dip down to the low B at the end of the first line. I like how it sneaks the 4 chord in there and then the wedge chord on the G# in the bass—which is just an E major chord in 1st inversion—followed by the 5 chord with a nice suspension in the alto. The second interesting melodic part is the big octave leap in the middle of line 2. It’s a bit unexpected in such a short hymn, but it’s a great way to open up the singing with some emotion before closing the verse out. The final interesting melodic moment is the leaping in the second to last bar. B-G-E, which is a broken 2 chord in reverse. Then it goes to the 5 chord before ending on 1. It’s a standard 2-5-1 cadence, but the tune spells out the 2 chord. I like that. This is another keeper. 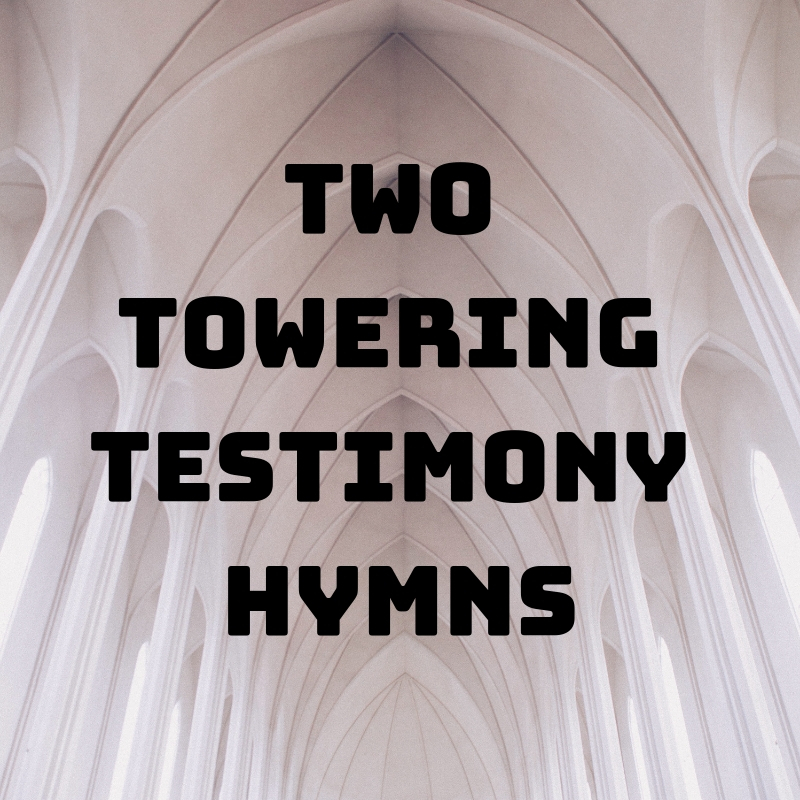 It’s nice to have a short “Testimony” hymn in case there’s not enough time for one of the longer ones. That’s all for today. Hope you have a good one! Here we arrive at another beloved hymn in our hymnal. This personal testimony of the Savior finds uses in many settings of life. It is a common hymn sung in Sacrament Meetings, in the home, and at funerals. 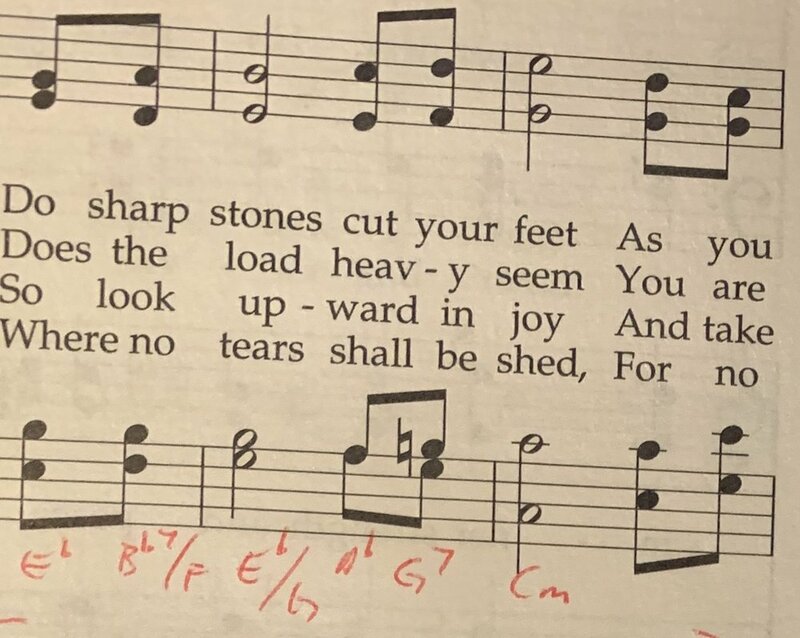 I think this a good hymn that deserves is place in the hearts of Latter-day Saints, but there is one element found in this hymn that truly irks me and that I have discussed in previous hymn, and that is the misuse of the fermata. Putting a fermata at the end of each phrase in the first section of this hymn only stultifies the melodic flow of the hymn and makes it very ponderous. We treat each fermata as a grand pause that brings everything to a crashing halt before it has even had a chance to get going. To give each phrase the same ending as the ending of the first big section (after everliving Head) lessons the impact of the conclusion of the first big musical phrase. Rather than making grand pauses at each fermata, it would be much better to think of those spots as a tenuto, or slight elongation of the tempo. I’ve even seen an arrangement that discards the fermata all together and keeps it a quarter note to great effect. I understand that this would run counter to how it has been ingrained across the church on how to sing this hymn and would require retraining on everyone’s part on how to approach this hymn, but it would vastly improve the musical flow and make it a much stronger hymn. In addition to seeking to remedy the over-segmentation of this hymn, the other great help is to play this at a tempo that doesn’t connote a funeral procession (even if you play it at a funeral!). The high end or just slightly faster than the suggested tempo is a good place to be. Another great help in getting some forward motion in this hymn is realizing this hymn in 2 rather than 4. So feeling the pulse around 42-43 beats per minute for the half note. The affect word for this hymn is peacefully, but I tend to think of it as a powerful testimony that keeps building in intensity. Therefore, I begin the hymn usually with Principals 8’ and 4’, and then build the registration each verse until I am playing the second half of the hymn on the fourth verse with most of the resources of the organ. This simple, elegant hymn is another good example of a very good hymn text matched with what I think is a very good tune. It shows that heartfelt text can communicate a message well and that tune writing needn’t be complex or obstrusive. I especially appreciate the story of the text’s origin, that Elder Dunn was moved by the powerful testimonies at a Regional Representative meeting that he was moved to write his feelings in poetry. I am drawn to a text coming out of a natural experience rather than a specific intention to compose a hymn text. This is another hymn that works very well if felt in two rather than four. I am always pleased when I set down to determine what the tempo is that the hymn works best at and find the suggestion in the ballpark. Like many other hymns, I would stay on the high end or just above the suggested tempo. 96-98 beats per minute is a good tempo for this hymn. I would prescribe a softer registration with good 8’ foundation to support the singing. One of my favorite General Conference talks of all time is President Hinckley’s “My Testimony” from the April 2000 conference, Sunday morning session. I was a new missionary in Chile listening to the prophet bear an incredible testimony. It moved me so deeply. I bought the cassette tapes (remember those?) and listened to this talk over and over again through the rest of my mission. I could practically recite it word for word. Just the sound of his voice, when I hear it now, brings me back to that time in my life. President Hinckley was my prophet. I followed him again and again during all those years of huge decisions about college, vocation, avocation, marriage, etc. Hymn #135 is a little talisman reminder of my prophet. And like him, it doesn’t beat around the bush. It gets straight to the point. I love the bold melody, the big leap at the beginning, the forward motion of the dotted quarter-eighths, and the quick marching tempo (at least it’s quick when I play it… the tempo marking is too slow…). The harmony has a handful G#s, C#s. This adds some intensity to the sound and gives it a flavor of the old Protestant hymns, which I love. The only part I’m not impressed with is the blaring parallel 5th and octave across the 2nd bar line. It’s really too bad that this one slipped in. It’s a very easy fix that keeps all the harmony in tact. All I’ve done is re-voice the chord on “my” in the first bar to prepare the inner voices in a slightly lower range. This makes the poorly written parallel motion go away. I’m sure it’s no small thing to suggest a change to a hymn written by a Prophet with music by a General Authority. But I wish the committee would do it anyway. We’ll see. This brings up a bit of a sore spot for me. There’s this pervasive nonchalance with regard to much of the music the Church publishes nowadays. Now, I have nothing against the composer personally, but the music is sub-par at best. It’s full of power chords, no 3rds in many of the chords, and blatant parallel 5ths and octaves all over the place. I realize we’re in the 21st century and all that, but come on. This is just lazy, uneducated writing. Not that you have to have a degree to write a song for the church. Not at all. But the editors who publish these songs have a responsibility to help the writers fill the gaps in their songs. Another example—and I’m sure I’ll get some flack for saying this—is the new favorite Primary song “Gethsemane.” It’s a beautiful message. The best! I LOVE that my kids can’t get it out of their heads. I love that it's in a minor mode and you get the real feeling for the Atonement of the Lord. But the piano part is so poorly written. It’s incredibly incorrect all over the place. The songwriters of both of these songs would fail 1st semester freshman music theory. They would fail high school music theory. They would fail grade school piano lesson theory. Again, I don’t really blame them. I blame the editors at the Church office building who agree to publish these pieces with all the problems in the writing. Come on! Let’s help these song writers, who were inspired to share their testimony through music. We can chat with them and help them improve the piece. I could spend an hour with the composer of “Gethsemane” and help him or her (I honestly don’t have any idea what their name is, but I wish them very well and thank them for their inspired song) and help them SO SO SO much to make a truly beautiful song WAY WAY WAY better by following some basic principles of proper voice leading. Look, we have incredibly high standards in the Church when it comes to our doctrine, our training manuals, our teaching manuals, our temple building, the paintings within the temples (which, by the way, are painted by artists who use the basic principles of the great masters to create their works of art that help us worship). Why are we so lazy and lax with the music? We can do WAY better. It’s really not that hard. I just takes a little extra effort and help. Take the Tabernacle organists for example. Every one of them has a doctorate in music. They can’t even apply for that job unless they have, or are about to finish their doctorates. Those are incredibly high standards. Surely we could ask the chairman of the music committee, who also has a doctorate in music, to work with the inspired songwriters who submit pieces to the church. Ok… I’ll stop. I just think we can do better. We can raise the bar. We do everywhere else. Why not in music? I’m not at all saying we should do away with these songs. I’m saying that we need to improve them so they aren’t filled with errors and sub-par writing. President Hinckley was the prophet of my youth and early adulthood. He became president of the church when I was 14 and passed away when I was almost 27. That is some of the most impactful times a a persons growing-up years. Therefore I look upon his words and works with great fondness. Such is our fondness for President Hinckley that our second son’s first name is Gordon. I love that we have a wonderful and powerful hymn bearing testimony of the savior by President Hinckley. I love this story as it relates to the tune for this text: “When President Hinckley first heard Elder G. Homer Durham’s hymn tune, without knowing the name of the composer, he felt it was just the kind of direct, simple tune he had hoped for. When he learned the composer’s identity, he was even more pleased. The two men had been lifelong friends, from grade school through college and mission days and beyond.” That is from Sister Davidson, and I would encourage you to read the entire entry for this hymn (and get the book. It should be in everyone’s library!). Ok, “worst” is a little harsh. But Hymn #132 is not a popular one for good reason. It’s sad, really, because it starts out in a very promising way. The first line is lovely and fresh sounding. But Brother Asper gets a little ‘too’ creative for his own good. The harmony quickly becomes too out of the ordinary, especially in the first two bars of line 2 and line 3. It’s kinda like hitting a speed bump in the dark, the kind that don’t have any reflectors on them. It’s a bit too unorthodox to lead the singer seamlessly from phrase to phrase. It detracts from the message and the flow of what should be a smooth musical experience, especially when we’re singing about the temple. The last line isn’t bad. But take a look at the harmony at the beginning of lines 2 and 3 so you can make sure you don’t fall into the same trap of over-cleverness. Hymn #133, on the other hand, is a beautiful, smooth, no-speed-bumps-in-site kind of hymn. It soothes, it summons, it sings! And effortlessly too. There’s a nice pattern going on here. 1 bar of the same harmony, then we move to a new chord which sustains for the 2nd bar. Then in the third bar, the chord changes every 2 beats before resolving to the 4th bar’s chord which agains lasts the full bar. This happens again in the next 4 bars, and yet again in the 4 bars after that. Only the final 3 bars does this harmonic rhythm speed up. Having the first 2 bars each be a sustained chord gives those early bars the feeling of anticipation. “When’s it going to move? Will it? And where will it go?” Because it moves so slow, we’re not really sure. But by stepping down to the 2nd bar we get a sense that it’s going to move again, but when and where, we’re not sure. So our attention is caught right from the start. There are some nice inner-voice chromatic wedges. D#s that fit between a rising D to E. And then it happens in reverse in bar 8. These slow and subtle harmonic changes are what make the somewhat static melody line interesting. When the melody stays on the same note but the bass moves a bit, we know right away that the melody will move soon. It taps our curiosity. The 2nd phrase does the same kind of thing as it starts. But this time it starts a 3rd higher, so our expectations are even greater. There’s not much of a climax other than the high C. But our attention is focused and interested the entire way, from start to finish. This is a well balanced, well executed hymn. The conservative register and lack of super big leaps makes it very easy for a congregation to sing. And the harmony, though chromatic on occasion, adds color without chucking in speed bumps along the way. This is a keeper, for sure! That’s all for today, hope you have a good one! I would love to know how many readers are aware of the existence of this hymn. We may not have discussed a more obscure hymn in our hymnal to this point. Unfortunately, I think there might be good reason this hymn is so unknown and unsung. The text seems to bear similar characteristics to other hymns of the time it was written. It strikes me as a rather typical hymn text. I have stated in previous reviews my affinity for hymn tunes written by organists. I have found each previous hymn by organists in our tradition to be excellent, but I don’t think I can say the same for this hymn. Frank Asper was Tabernacle Organist in the middle of the twentieth century with Alexander Schreiner, and has many excellent compositions and arrangements, but I don’t think this tune quite matches some of his other works. The melody isn’t very tuneful or ear-catching, the melodic deviations from the key are rather awkward and difficult to follow, and the harmonization also does not help or make much sense, especially to a congregation. All of this combines for a rather disjointed and awkward hymn that I think is difficult to sing. If you ever were to find yourself accompanying this for congregational singing, after overcoming your surprise at playing this hymn, I think you would also find that the suggested tempo is far too slow. It flows better around 112 beats per minute. I think that the suggested affect word is a bit misleading. The nature of this hymn strikes me much more as a robust or energetic hymn. Therefore, I would recommend a strong registration utilizing at least a principal chorus is appropriate for this hymn, perhaps adding a mixture for the second verse. I am going to veer far of course here from my normal suggestions, but I think that the suggested tempo here is too fast. To maintain the reverent affect of this hymn, I would play it around 76-82 beats per minute. Not so slow that it is drudgery, but not so fast that it rushes, which I think it does at the suggested tempo. I think the forward momentum is maintained even at a slower tempo. A softer registration is also appropriate for this hymn. How can a piece of music depict humility? If I was composing a hymn with this title, I would feel like I was being very presumptuous. Then, the tune needs something special in it that brings out the right kind of emotion. What Grietje Rowley does is use various types of suspensions to create his “humble” sounding music. At the start of the hymn there are multiple suspensions right away. The down beat of bar 1 suspends the soprano, alto and tenor over from the pickup and then resolves down to the first 1 chord. The next down beat does it again in the soprano and alto. Bar 3 does not have any normal suspensions, but the chord is a sort of suspended 1 chord. It’s really a 4 chord, but with C in the bass. So it’s like an entire suspended measure hovering over the 1 chord, rooted by the C in the bass, and then finally resolving to a 1 chord at the end of the line. It’s the same kind of sound as a regular suspension. The 2nd bar of line 2 begins with something similar to a suspension, but this is an appoggiatura. The G in the soprano doesn’t fit the chord and resolves down on the next beat. Line 3 begins with the same suspensions as line 1. Bar 3 of line 3 is similar to bar 3 of line 1. But this time the melody leaps all the way up past the high 1st scale degree and lands on the 2nd scale degree, a high D. But the harmony is the same kind of suspended 1 chord. This time it goes even further with the D# and F# on the down beat of the last bar, but it resolves to the 1 chord just like line 1. Line 4 begins the same way line 2 does, but this time bar 2 has a real suspension, not an appoggiatura. The last part of the line finishes the warm sounding music with a low 4 chord (the low Fs in the bass) and another type of suspended 1 chord. This time the suspended 1 chord in the 2nd to last bar is not a 4 chord with C in the bass. This time it’s a C chord with G in the bass that goes to a G7 chord before resolving to the final 1 chord. All these suspended kinds of sounds work well to depict the humble feel Rowley is going for. My favorite bit is the 3rd to last bar when the C# in the also gets lowered to a C natural underneath that final soprano suspension. It’s a very warm downward slip of harmony that closes the harmony of the hymn with a special little gem moment. This is a very effective hymn. It’s a MUST keep in our hymnal. Similar to the question above, how can a hymn bring about the feeling of wanting more holiness in one’s life? In this case there are 3 key elements in the success of Philip Paul Bliss’s writing. The 3 elements are the use of “pedal” notes, the duet-like sounding use of 3rds and 6ths between voices and the consistent use of eighth-note triplets. The rhythm is the same in every bar. Quarter note, 3 eighth-not triplets, then 2 quarters or a half note. 8 iterations of the same rhythm could get boring quickly. But by using it as only 1 of 3 consistent and interesting elements, the rhythm stays fresh throughout. Take a look at line 1. The bass sings the first pedal point of the hymn carrying the D all the way through the first bar. The soprano and tenor sing in alternating 3rds and 6ths. Bar 2 has all the same elements. But this time the tenor and bass take the 3rds and the alto sings the pedal point. Line 2 begins exactly the same as line 1. The 2nd half moves the pedal point again to the alto but continues the 3rds between soprano and tenor. Line 3 moves the main pedal point to the soprano and the tenors join in the fun. They are singing a 7th apart which is a dissonance that desperately wants to be resolved, giving this phrase it’s particular strong sound. The alto and bass take up the ascending 3rds. In the 2nd bar the soprano and tenor continue the pedal point and the bass is the only moving voice. Line 4 keeps the pedal point in the soprano with the climactic high C. The altos join in the pedal and the tenors and basses rise in steady 3rds. The last bar moves the pedal point back to the bass and the soprano and tenor return to the 3rds and 6ths. The building blocks are incredibly simple. What keeps our interest is the variation of these 3 main elements. Bliss moves them around, juggles them and uses them to color the text beautifully. This is a gem of a hymn and another MUST keep in our hymnal. That’s all for today. I hope you have a great weekend! This is the third hymn in a row that has the same spirit of affect, message, and tone, and my response to this hymn is the same as the previous two. I like this text, with the message of humility and its associated blessings. But I think like the previous hymns, it lends itself much more to a devotional application than perhaps a more general setting, unless the subject of a a talk is overtly about humility, in which case this hymn is a very good musical response. I think the tune is good as well. I especially like the contrast in the second statement of the theme, where the high note goes to a D, rather than the expected C. It sets up the rest of the descending melody line quite nicely. I also like how the simpleness of the harmony in the first phrase and its restatement is simple, which provides greater contrast for the harmonic movement of the second and fourth phrases. I don’t mean to sound too repetitive, if one can remember what my remarks are from day to day in these reviews, but I seem to repeat over and over that the suggested tempos in our hymnal are often much too slow and almost always too wide. Here, the upper range of the tempo is good, in fact, I think I play it always at 76 beats per minute, which is the upper limit of the range. But I would play it no slower, and perhaps only a titch faster if need be. 63 is far too slow, and with this hymn, would lead to much lethargy. I would use the same basic quiet registration as recommended in previous quiet hymns. Philip Paul Bliss is responsible for a couple of the more beloved hymns in our book. This is actually one of my more favorite hymns in our book, and I think a couple of arrangements are responsible for my affinity for this hymn. One is the arrangement by Ronald Staheli, https://www.youtube.com/watch?v=2V1s8SmtX7g, (oh my goodness, the BYU choirs at General Conference. How sublime!) and the other is an organ prelude for organ arranged by Darwin Wolford. I love the poignant plea for the granting to us of more Christlike attributes. I think the text is very well matched with a plaintive and pleading tune. Perhaps a difficult property of this hymn in consideration of accompanying this hymn for congregational singing is determining whether it is in simple or compound meter.It is notated in simple meter, but one could successfully argue that since the moving notes are all triplets, that it is truly a compound meter. However you conceive it, it is important to keep a steady tempo. I find the suggested tempo for this hymn to be very good. And, dare I say it, I think that the high end of the suggestion might be slightly too fast. I probably play it around 44-46 beats per minute. But take care not to let the tempo drag and get slower as the hymn progresses. Long distance collaboration is fun, but has its challenges. Both of my operas and most of my cantatas were written almost entirely long distance from my librettist. We had many phone conversations with singing and piano playing and text workshopping. Thank goodness the iPhone comes with a headphone jack. I can’t imagine how much harder it would be to work like this while holding a big old clunky phone up to my ear. Much of Hymn #129, “Where Can I Turn for Peace?” was composed this way. This story takes place in 1971, long before cell phones. Surely the collaboration came with a big pain in the neck! “I happened to be in the music room of our home at the time. Sister Thayne said she had been thinking of a message of hope and peace as the hymn’s theme. As she began to relate some of the beginning lyrics, I stepped to the piano (I had a long telephone cord) and said, ‘Sounds good — the music should go something like this . . .’ She said ‘good,’ and gave me another line. I responded with additional measures of music. Before the conversation ended, we had mostly ‘roughed in’ the basic hymn. We have lovingly spoken of this number as the ‘telephone hymn’ throughout the years.” (Davidson, ‘Our Latter-day Hymns). The text came to Emma Thayne in a time of great difficulty. She felt a personal solace after a period of what seemed like constant prayers and pleas of help. I really like the personal nature of the hymn, the first person perspective. It makes me think of the personal journey we each have with the Savior through trial and challenge. The Atonement of Jesus Christ is the most universal and most personal act of love. We come to Jesus as a congregation, as families, and as individuals. Having beautiful hymns from each perspective is important. This one in particular has helped me many times. Lines like “in my Gethsemane” are particularly poignant. I’ve been to Gethsemane. Though I went with a large group, we each quietly went our separate ways and had special time alone to contemplate what occurred there. It was a beautiful, personal, private experience. The tune begins with a gentle falling tune down from the middle register. Then it returns to the A it began on and goes the opposite direction to fill out the register a bit. Underneath that first line we have at first a steady, pedal D. And then we get the sorrowing sigh of descending half steps from F# to F to E with the tenors joining in the sorrow, but up a 3rd, A, A-flat, G.
Line 3 is similar to line 1. It’s nearly identical at first, then rises in a similar way but takes us all the way up to high D. The bass does another kind of half step emotional movement. This time it leaps tot he A# adding some gnarly emotions, and then resolves up by half step. The great moment here is at the end of the line. The octave leap down and then back up to the beginning of line 4 gets us into the emotional river quickly, if we weren’t already paddling through the rapids. Line 4 begins with the climax note and a descent down towards the final cadence. The last 2 bars answer the question posed in the last 2 bars of line 2. They both start on the same G. But this time, instead of pausing on the 2nd scale degree with a musical and an actual question mark, we get the musical answer with a final D.
This hymn gets the highest marks from me. It teaches the gospel, it soothes, it communicates, it welcomes the congregation in, it’s easy to sing. It ticks all the boxes. I think I have the same response to this hymn as to yesterdays hymn. This is a beloved hymn in our tradition, and it is a good hymn like yesterday’s, but it doesn’t rise on my list of best or favorite hymns. Like yesterday’s hymn, the tune is a very fitting match for the text. The reverent nature of the tune lends well to the message of yearning for and discovering in whom we find peace. This hymn for me falls much more in the camp of being much more fitting for a personal devotion in times of spiritual need rather than in corporate worship. This hymn reveals an all-too-common danger with soft hymns, which is that far too often reverent is equated with slow. This tempting thought must be avoided at all cost. There needs to be forward motion and momentum in this hymn. The suggested tempo for this hymn is too broad. The high end of the tempo is a good tempo for this tune, and I would take it at 100 beats per minute. 80 is too slow, though. A reverent registration is appropriate for this hymn. Today we take a look at a hymn by a living Latter-day Saint composer. None other than Dr. Stephen Jones, professor of composition, and former Dean of the School of Performing Arts at BYU (I think I got that title right…sorry if I didn’t, Stephen…). Though he’s a generation ahead of me, we both earned our masters and doctoral degrees at the same school (University of Cincinnati, College-Conservatory of Music) and studied with the same teacher (Dr. Joel Hoffman). Stephen is a fantastic composer! His works have been performed by many major ensembles around the world including the Chicago Symphony, the Cleveland Chamber Symphony, the Utah Symphony, and many others. He is also a former Stake President. When his lovely hymn, #128, was published in 1985, he was only 25 years old. He was off to a great start. I really like his hymn. The only downer for me is that it has only 1 verse. I wonder if this is why we don’t hear it very often in Sacrament meetings? There are many layers of communication involved in the art of composition. When a text is involved, we get another couple layers, at least. And when the text is intended for use in a worship service, we add yet more layers. For this reason, it is for me, one of the most challenging, yet most reward types of composition. It’s easy to write big complicated music. It’s much harder to write music that is meant to be voiced by a congregation of many different ability levels and be music that moves them emotionally, spiritually, and is music that is appealing, singable, a delight to hear, uplifting, etc., etc. Every note send of emotional signals. Every note attaches to a word in a phrase that is intended to elicit a feeling in the singer or hearer. This reminds me of something Albus Dumbledore said in the 7th Harry Potter book. So true! But then there’s the tone of voice that adds another layer to the power of words. Tone can completely alter a series of words. Try saying a phrase with different tones of voice and see how quickly it changes the meaning. Music can take the “inexhaustible source of magic” created by the words we say or sing, give them a tone of voice, and then attach to it an emotion. That sounds simple, but how easy is it to describe your emotions exactly? It’s terribly difficult to convey the precise feeling or motivation or yearning one feels inside with words alone. That’s where music comes into play. So when a composer sits down to put musical notes to a sacred text meant for worship, the composer is not just a craftsman, he or she becomes an influencer, a marketer, a persuader, a psychologist, a prognosticator, a soothe sayer, an alchemist. The baroque composers understood this implicitly. They called it, the Doctrine of Affections. Stephen Jones understands this and knows how to use these tools. I’ll let him tell you about his process, his ideas, his alchemy. “The opening lines express faith and confidence in the Lord’s love. Here the repeated, stable bass gives the music a solid, foundational beginning. The modulation in the second phrase lifts the music, depicting the ‘inner strength and peace of mind’ found through the Holy Ghost. “The third phrase is the only one that does not begin with a solid, foundational bass. Here the bass and soprano move outward, opening the sound of the music and depicting the act of giving the Father our trust, prayers, and humility. The highest note in the melody occurs in this phrase, perhaps indicating a reaching out to God with the willingness spoken of in the text. For those who are writing hymns, I recommend careful study of this hymn. Pay close attention to the balance between consonant tones and dissonant tones. Hear their gravity. Study how the harmony subtly enhances the gravity of the melodic tension and resolve. I vote that we sing Stephen’s beautiful a whole lot more! And, I vote that we add some more verses. It’s a beauty. It’s a keeper. It’s a great example of a hymn that does what a hymn should do, it moves the congregation to feel, to see, to act. Great work, Stephen! This is a hymn that I am rather lukewarm about. The text is okay, and the music is okay, thus making a serviceable hymn, even if it doesn’t stir in me the type of reaction that other hymns in our survey have. Again, this may have to do with my preference for objective hymns. This hymn, being in first person and more relating to a feeling or response to a point of doctrine is more subjective, rather than expounding upon the doctrine itself. This hymn and its explanation of tune I think is much in line with what Doug is looking for or describing when he discusses the tunes and their relation to the text, but I am not always convinced of the musical elements actually conveying a specific point. I can appreciate the words of the composer and his intentions, however, I don’t know that I would identify these aspects without the explicit definition or explanation. But I readily acknowledge that this explanation might ring true or recognizable for others. I think the tune moves along nicely a bit faster than the suggested tempo. I find that I play this hymn around 96 beats per minute. I would also disregard the fermata in the middle. I find it disruptive to the forward motion of the text and tune and that just a slight acknowledgement of the phrase ending is enough, rather than treating it as a dotted half note. Treating it as if there were a tenuto mark there I think works much better that a pause or cessation of the pulse. I would use a quiet registration similar to many of the recent hymns. Ah, the sultry symphony of seriously sick-and-tired kids on a super slow and sustained sojourn across the country! Our family has made the drive from Cincinnati, Ohio to Utah Valley more times than I care to remember. 1,600 miles, 1,600 dirty diapers, 1,600 temper tantrums, 1,600 bathroom stops, 1,600 tosses and turns in highway hotel beds with crusty pillows. Not. My. Favorite. Way. To. Spend. Three. Days. Driving through Indiana, Illinois and Iowa isn’t so bad. There’s a bit of beautiful countryside. By the time we get to Nebraska, we’re really feeling it. And the sites are less than exciting. But then there’s Wyoming. Dreadful, dreary, dilapidated, deserted, desolate Wyoming. O the torture. O the almighty bleakness. And I swear, every time we go through Wyoming, there’s some sort of apocalyptic hail storm. I keep imagining a monstrous cyclone in the prairie that’s about so whisk us away and plunge us to our death. “Does the Journey Seem Long?” asks hymn #127. YES! RIDICULOUSLY LONG INDEED! Well, the music doesn’t depict the psychotic pain of 3 long days trapped in a metal box on wheels with 5 beautiful children turned murderous zombies. Nor does it depict that after a 2 week stay with family that we have to turn around and MAKE THE DRIVE ALL OVER AGAIN!!! In fact, the music is quite pleasant. I remember seeing this title many times. But I don’t remember ever having played through the hymn. I really like the music. It has a folksiness to it, kind of like “Home on the Range.” I can almost hear the “boing” of a Jew’s Harp in the background. My one grip is the misplaced subject in the sentence in the pick up to bar 3 of verses 1 and 2. Every other pick up in the hymn leads to the subject of the sentence which comes on the following downbeat. But in this case, “The path” and “Your soul,” the subject of the sentence comes on the eighth not right before the downbeat. It make it feel off-kilter. The only way to fix it is to change the text. One of my favorite aspects are the two moments where George Pyper uses pedal tones to create the sustained, prairie-like environment of a long journey. Line 2 begins with one of these pedal tones in the alto, the steady C with the harmony all circling around it. The next time this occurs is at the very end, to bring it home to its final destination. This time the soprano and bass hold pedal B-flats while the alto and tenor shift the harmony all around it. The best spot is on the word “heat.” The A-flat chord over the pedal B-flats makes a lovely, tangy sound. My other favorite spot is the slip into C minor. The 2nd line ends with a cadence in C minor and continues to line 3 with this tonality. After a bar full of steady G7 chords at the very start of line 3, we slip back into E-flat major by moving the bass up a half step to A-flat and the soprano up a half step to C. This makes an A-flat major chord, a 4 chord in E-flat major. Then we’re “home, home on the range” again and brought soothingly home over the pedal B-flats. Very nicely done. Its soothing, thoughtful, and not at all like the long 1,600 mile-long journey from Cincinnati to Utah with screaming children all the way. I’ll swap the experiences any day. That’s all for today. I hope you have a great one! This text was written while Joseph Fielding Smith was riding a train to Arizona (where he was treated to miles and miles of desert, a site I personally find very dull and dreary). I imagine him contemplating the long journey and turning to poetry to occupy his mind. This text is a wonderful pondering in question-answer form that I imagine is very relatable to many people. The tune was written for this text by George D. Pyper, who held several notable responsibilities in the church, including General Sunday School Superintendent and as one of the editors of Deseret Sunday School Songs (1909). I find it to be a fitting tune for this text. 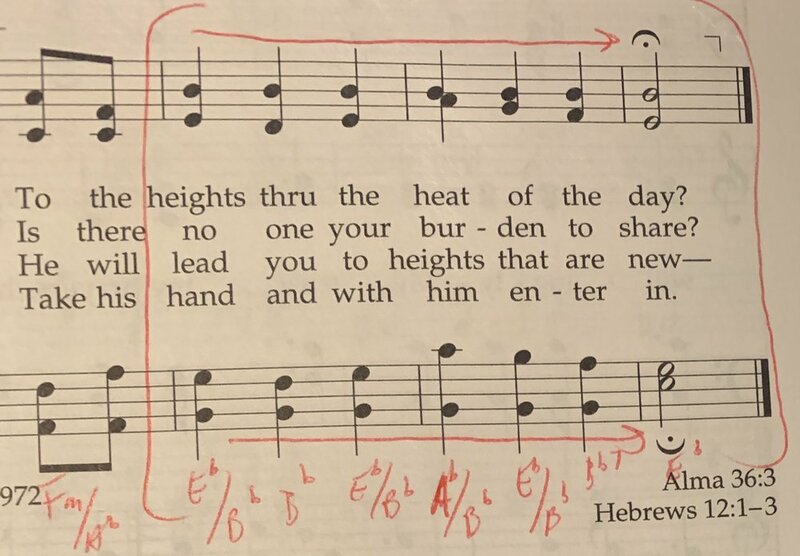 Like “The Lord is my Shepherd,” the altos take a turn with the melody for the final phrase of this tune beginning at the word “heights,” a somewhat interesting strategy. The suggested tempo is too slow for this tune. The melody flows very well and has nice forward motion around 94-96 beats per minute. Due to the unfamiliar nature of this hymn, I find it a very good candidate to solo out the melody, especially for the introduction. Another wonderful practice, especially with unfamiliar hymns, is to play the entire hymn as the introduction. This gives the congregation one hearing of it before engaging in singing. I would use a standard softer registration here, ensuring there is enough foundation, but also a bit of height in the registration, such as a 4’ or 2’ flute. Hymns in Minor Mode?! Blasphemy?! Why is there such an aversion to hymns in minor in our church? The minor mode opens up a whole set of new emotional possibilities. Maybe it’s the Molly Mormon idea that everything is sunshine and roses all the time. Or, that we should always be cheerful. I’m all for being cheerful. But that doesn’t mean that we sometimes don’t need to express the challenges of life. If we bottle it all up, we’re likely to explode. Getting into the minor mode sometimes acts like a release valve of internal tension for me. Hymn #126 is very deep in the sealed portion of the hymnal. Probably for the sole reason that it’s in a minor key. That’s really too bad because it’s a beautiful hymn. And, the text was written by an Apostle. We quote texts all the time that depict difficulty and challenge. Like Doctrine & Covenants 121 and 122 when Joseph Smith was in Liberty Jail. Those verses get pretty dark and gloomy, until the answer comes. Why can’t we do that more often in our hymns? The minor mode is perfect for that kind of expression. Well, hymn writers, I want to encourage you to work in minor when you feel the need. If more of us wrote excellent hymns in minor, maybe a few would catch on and we could make a change in the Latter-day Saint worship music scene. One of my hymns is in minor. It’s a Holy Week hymn called, “What Cost, What Price, What Debt We Owe.” My friend and collaborator, Dr. Carlton Monroe, director of music at St. Thomas Episcopal Church in Cincinnati, love this hymn. He told me that he can’t imagine a Palm Sunday without it. I was able to get deep into emotional content because of all the harmonic options the minor mode presented me. The tune in hymn #126 is nice, shapely, easy to sing (for the most part), and emotional. The harmony is also nice. I like the slow 2/2 tempo and the gentle moving of the harmony, sometimes in half notes, other times in quarters to reach a high point in a phrase. One small element that stands out to me as a nice touch is when the melody holds a dotted half note as the harmony moves in half notes. That subtle rhythmic alteration both moves the hymn forward and ads some nice variety. There is one spot in the middle of the hymn that makes the tune a bit awkward. It’s the C# at the beginning of bar 12. Avoiding the C# by holding over the D and descending down to the C-natural keeps with the feel of the texture. And we don’t lose the emotional content created by the slowly descending chromatic bass line. That does its job perfectly and is my favorite element of the entire hymn. All in all, I think this is a lovely hymn that should be programmed in our services. I love the way it goes a little darker to contemplate the internal challenges we all face. Music’s purpose in worship is to bring us closer to the Lord. Usually we yearn for Him most when we’re experiencing challenges. A hymn like this one can be just what one needs to bridge the spiritual gap between us and the Savior. This is a fantastic hymn, and so unfortunate that likely only those who have given significant study and consideration to the hymnal know of its existence. It could be that due to the paucity of hymns in our book in a mode other than minor, we are unaccustomed to hymn tunes in modes or minor keys. This is rather unfortunate, as some of the very best hymn tunes are not in a major key. We might do well to borrow some of them and place them in our new hymnal! The text of this hymn is by John A. Widtsoe, an apostle who also wrote the text for “Lead me into life eternal” (Hymn #45). It is a plaintive and sincere prayer to Heavenly Father asking for help with mortal frailties and seeking the hastening of the establishment of Heavenly Father’s kingdom, also teaching that seeking Heavenly Father’s will and truth are what help light our way. This text is an example of a lamentation or cry by Elder Widtsoe in the same vein as scriptural pleas, such as we find from prophets such as Nephi and Jeremiah. What a powerful example of how hymn texts of the wide variety of subjects for great hymn texts. What better manner to accompany a plaintive plea and lamentation that a tune in a minor mode. While minor keys need not always be associated with sadness, laments, trials, etc., music in minor modes do tend to often carry these connotations. The tune is masterful, as is the accompanying harmonization. Some elements of this tune and harmonization that make it one of the finest hymn tunes we have in our hymnal include: the rising bass line in the first phrase, the amount of time in the hymn that the bass note is not the root of the chord, the deceptive cadence at the end of the second phrase, the descending chromatic melody in the third line, and the final cadence with the use of appoggiatura on the final word, delaying the resolution to the final chord. I cannot stress how great I think this hymn tune is. It is masterful. I like the suggested tempo. It is appropriate for the solemn nature of this hymn. This is one hymn that I think can afford to go slowly, and the suggested tempo is I think a very good range. On how to register this hymn, I would explore the darker colors of the organ, likely utilizing the Hautbois if it is dark in color (but not if it is more similar to a Trumpet…), and using 16’ stops in the manual divisions, especially toward the beginning. How can you keep the tenors happy in your hymn writing? It’s not hard. Tenors are kind of like my 8 year old when she stays home sick from school. She thrives on motion. She wants something to do at all times. When she’s home without any other siblings or friends or classwork to keep her occupied, she’s bored out of her mind. The same goes for tenors. Altos get this way sometimes, but they’re usually much more patient and understanding of their role than tenors. Tenors fancy themselves as heroes, always in the action. When they get benched, life stinks. It’s kind of like Mr. Incredible in the new hit movie Incredibles 2. He gets benched and his wife gets to go out and be the star. He tries really hard to be okay with it, to let Elastagirl get the glory. But he’s miserable inside. Hymn #125 is a great example of keeping Mr. Incredible-Tenor happy. Through the entire hymn, he’s on the move. Even though the harmony is rather simple, just 1 chords 4 chord and 5 chords, the tenors get to move in a duet with the sopranos throughout the whole hymn. Because the melody leaps around in thirds a lot, it make create a soprano/tenor duet very easy. So the basses and altos lay down a stead harmonic backdrop and allow the sopranos and tenors to hop around depicting the kindness of God as manifest through keeping His commandments. It’s a nice way to put together a hymn. I have to admit, this hymn does not thrill me. But it’s solidly built and keeps the singers happy. I’m glad it’s short. This more basic type of writing gets old much faster in a longer, 4-line structure. It works much better in a short offering like this one. P.S. Do you have a friend who’s excited about Latter-day Saint church music? If so, please share these posts with them. They can click this big green button below to subscribe. This tune is most often set to the text “Blessed be the tie that binds” in most denominational hymnals, but the text “How gentle God’s Commands” is most often found with this tune. Thus the tune is well-known, in not the greatest hymn tune written. It gets the job done, though. A great arrangement of this tune for organ is by Robert Manookin. The repetition of the melodic notes and harmony can cause this hymn to be very notey if care isn’t taken in how one prepares to play this. If the tempo is too slow and emphasis is given to every beat, it plods along and becomes quite pedantic. Therefore it is wise to conceive the pulse in one rather than three and to have a good tempo that moves the melody forward. A good tempo would be with the dotted half note getting around 37-40 beats per minute (111-120 if you need the metronome for each quarter note). A nice, light, registration with a 2’ flute I think would work well for this hymn. Not many hymns come from the traditional Symphonic repertoire. I think Beethoven’s “Ode to Joy” appears in some hymnals, though not in ours. But I’m hard pressed to think of any other famous hymns hymns that appeared first in a piece for large orchestra. “Be Still My Soul” is the middle section of a great, Nationalist piece of music by Finland’s greatest composer, Jean Sibelius. The opening of the piece is very robust. It sounds as if war is coming. Dark clouds brood over the landscape of snarly trombones and roaring timpani. After this initial throat clearing, we’re off to the war charge. Chariots and horses and swords a spears. It gets pretty exciting and pretty intense. After this initial battle, there’s a shift if perspective. The forward motion continues. The tempo is quick. The battle still rages. But over the top of the forward thrust comes a heavenly hymn. A comfort during the battle. A balm in the heat of war. The tune we know as “Be Still My Soul” comforts the warriors as they continue to fight for their country. The adrenaline continues to surge, but the heart is calmed and the spirits are lifted. This is the context of this hymn. When I hear this hymn played or sung at a ridiculously slow tempo, as it usually is, I can hardly stand it. It’s such a great hymn. Yet it gets completely butchered at the typical snail’s pace. It needs to be conducted in 2. It should have been scored with a 2/2 time signature instead of a 4/4 marking. The metronome marking should read With Spirit, Half note = ca. 56. The genius of this hymn is its rhythm. When it’s taken at an appropriate tempo, the hymn lifts off and soars into graceful flight. The syncopated entries, the dotted quarter eighth figure, followed by another syncopation on the long notes. The bumping up against the beat that’s created is completely lost at a slower, plodding tempo. And poor, brilliant Sibelius turns in his grave. Thy rhythm is not complicated, but it’s off set just enough from the norm, that it makes for a delicious musical experience. And you get a sense of the forward motion of battle. And isn’t life a battle? Don’t we need a heavenly rallying cry to aid us in the day to day battle of life while we’re zooming on our figurative horse and combating life’s challenges? YES, WE DO! So please, don’t take the tempo slow ever again. It destroys the essence of this music. Another wonderful element is the simple tune. It doesn’t do anything wild melodic acrobatics as some other interesting tunes. Instead, it keeps to a very small range. But what’s brilliant about it is the lack of Do in almost the entire melody. Only a few times does the tune actually land on an F, the 1st scale degree. And when it does, in most cases, it’s mid-phrase and in camino to the next syncopated cadence. Keeping the tune hovering around Me (the A) and Sol (the high C) add to the “up in the air” feel of the hymn. It’s afloat most of the time and only touches solid ground at the very last minute. Lastly, the bass line creates a 2nd melody which is almost as interesting as the main melody. It accompanies it in a very satisfying and singable way. All of these things combine to create a hymn built by keeping an eye on the altimeter gauge. It’s the kind of hymn that was composed not to follow rules or frameworks. It is a vignette into real life, with real lift off, with real tension and release build into the rhythm and flow, instead of relying on harmony alone. It’s is an excellent slice of a fine symphonic work turned into a powerful hymn. But don’t forget where it comes from. Try to keep it in context. That’s where it works it’s magic best. This is another sublime hymn that benefits by being set to one of the most beautiful melodies written by Jean Sibelius. The text is very poignant and speaks of a plea for the stilling of our souls in times of grief and pain. 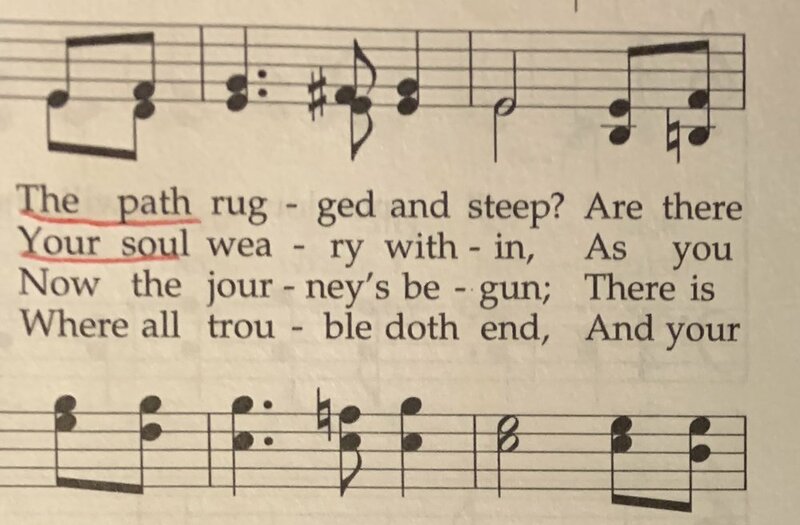 There is a fourth verse of the English translation omitted from our hymnal that seeks for solace in the departing of dearest friends, making this hymn even more appropriate for funerals. The tune comes from the Finnish composer, Jean Sibelius’ tone poem, Finlandia. It is instrumental in nature, but pairs excellently with this translated text. Because of its instrumental nature and the length of the melodic lines, it can be somewhat difficult to pull off well for congregational singing. It is therefore imperative that the tempo of the hymn be such that the long lines are singable without dragging. Thinking of this hymn in 2 goes a long way in aiding in keeping the motion moving forward. A tempo of half note equal to around 56 beats per minute I find to be a good tempo to encourage forward momentum. Another difficult characteristic of this tune is that the phrases begin on the weak beat immediately after the downbeat. This can be somewhat difficult to navigate and make clear for the congregation to sing. This is where I think Mack Wilberg’s arrangement for choir is brilliant and could aid very well in approaching how to accompany this hymn for congregational singing. What Brother Wilberg so brilliantly does is put something on the downbeat that aids in the motion of the hymn and feeling comfortable knowing where the next phrase begins. So on the downbeat at the beginning of the hymn, he has a I chord and then the voices come in. At the downbeats immediately before each phrase entrance, he has a harmonic movement or some other way to emphasis the downbeat and provide a great roadmap for the congregation to come in on the next phrase. I highly recommend studying and analyzing his arrangement to find ideas on how to lead the congregational singing for this hymn. I shamelessly admit that I borrow his harmonic language when I play this hymn, especially on the final verse, but choose to highlight the downbeats preceding each phrase entrance as well. I think it is a great solution to the bit of puzzle this hymn tune presents. I would again use a more subtle registration, ensuring that I have a very strong and broad 8’ line.